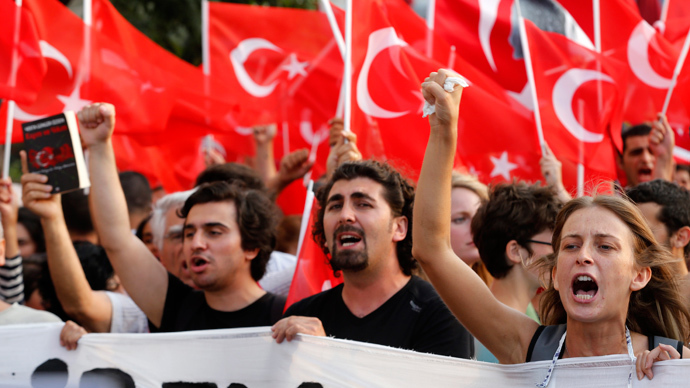 Turkish police fired teargas canisters at close range and directly at people during the Gezi Park protests causing serious injuries, says a report by the Human Rights Watch. Those hit by canisters lost eyes and received life threatening skull fractures. The Turkish authorities “should immediately issue improved guidelines on when and how teargas may be used that included a prohibition on firing teargas canisters in confined areas or directly at people,” Human Rights Watch (HRW) said. 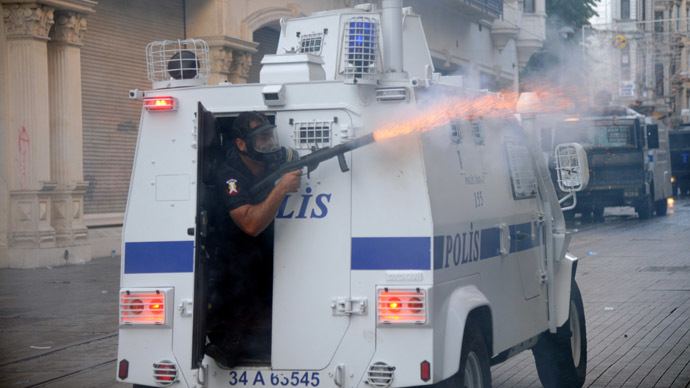 The report titled “Turkey: End Incorrect, Unlawful Use of Teargas,” which has been published on the group’s website, also calls to “strictly enforce” such policies, and hold non-compliant police officers accountable. At least 11 people lost an eye after being hit by a teargas canister or a plastic bullet in Turkey up to June 27, says the statement by the Medical Association quoted in the report. Dozens of others received serious head or upper body injuries. Interviews of victims, witnesses, lawyers, and medical personnel cited in the report suggest that such injuries were caused by police firing tear gas from launchers directly at people, often at close range. The “scale and consistency” of such accounts point to “a clear pattern of misuse of teargas by Turkey’s police force,” HRW states. Ten accounts of victims who were seriously injured in police tear gas attacks have been documented in the report. Those include a university lecturer who lost his eye as he was walking down the street in Istanbul’s rioting Besiktas district; a long time Taksim square protester who got an 8 centimeter skull fracture and a psychological trauma; a woman taking part in a peaceful sit-in protest who was shot unconscious, had her skull fractured, and was held in an induced coma for 24 days after; as well as a 14-year-old boy apparently caught in close-range police fire near his family home, who suffered from intracranial bleeding and has remained in critical condition for over four weeks. 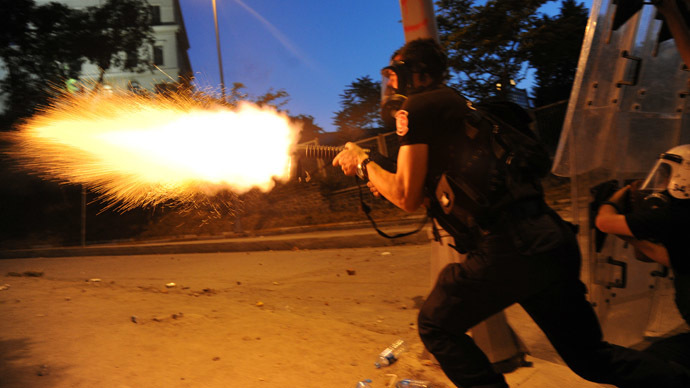 “Shooting in this way directly at people is a systematic policy of the Turkish police,” Unveren believes. 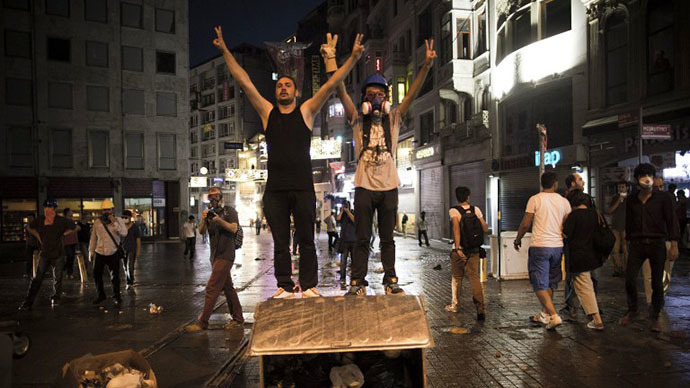 Okan Gocer, 23, who was taking part in a peaceful June 1 protest several hundred meters from Taksim Square, said he was telling people to stay and not to be intimidated by a heavy police presence, when a tear gas attack was launched without warning. “They just popped out. There were no warnings. They just attacked right away. There were many shots ‒ they just opened fire. One of them hit me in the head. I think the police might have targeted me because I encouraged people to stay,” Gocer said. The teargas canister that struck the protester rendered him unconscious and caused a 7-8 centimeter fracture to his skull. Gocer had to undergo emergency surgery and was kept in an induced coma for more than two weeks. Nearly a month after the incident he said he still struggled with the pain, and that he was no longer a “cheerful” person “full of hope and optimism” that he used to be. Secil Sucu, 21, a female protester who witnessed an earthmover used against the police vehicle in Istanbul’s Besiktas district, was trying to leave the area of violent protests, but was blocked by the tear gas firing police in one of the side streets. “We were blocked in. When I turned to see how far away the police were, one policeman rushed toward me, aiming at me with his teargas launcher. He was perhaps 10 meters away. There was no place for me to hide so the only thing I could do was to try to protect my head. I had started to turn away when the teargas canister hit my goggles, breaking them. My head was ringing and then all went quiet and white. I thought that this is how people die,” Sucu said. 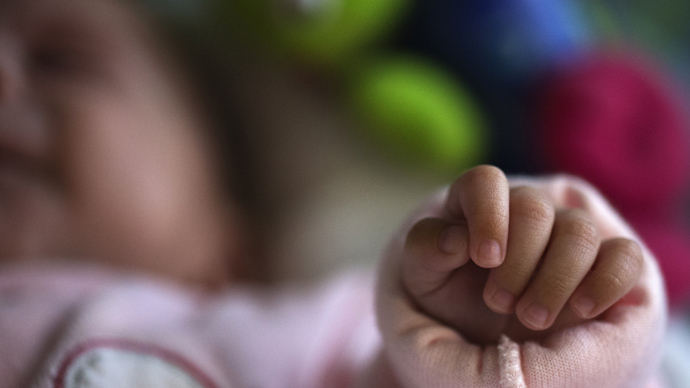 Later in the hospital, Sucu was told she had a six-centimeter skull fracture and that it would take her months to recover. She now admits to having “panic attacks” and being afraid to stay at home alone. For Lobna Allamii, 34, the life changed forever after the brutal crackdown on peaceful sit-in protest in Taksim square on May 31. Following the sudden police attack the woman was found lying on the ground unconscious and having seizures. Allamii was operated on twice after the doctors found a fracture in her skull, a severe injury on the left side of her head, and intracranial bleeding on the right side. The woman was kept in an induced coma for 24 days, had her right arm partially paralyzed, and her speech and eyesight damaged. A 14-year-old boy, Berkin Elvan, who sustained serious head injuries and has remained in critical condition for more than four weeks, was not taking part in protests, but got caught in a police attack in Istanbul’s Okmeydani neighborhood on June 16. According to accounts by family members and friends, the boy went out to buy bread from a nearby bakery when the police started firing rounds of tear gas at the protesters that had gathered in the area. Berkin’s lawyer has quoted a witness saying the police hit the boy with a teargas canister from a distance of 10 to 15 meters. Doctors of the hospital where Berkin was taken for surgery also noted the boy smelled of gunpowder – another possible indication of a close-range fire. The boy’s case went viral in Turkey, and several actions in his name have been organized, with a protest march for Berkin Elvan taking place on Wednesday. He is still in intensive care. 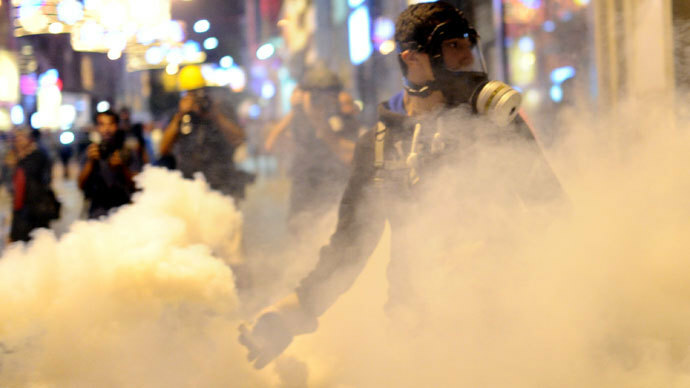 Reports said that the Turkish police used 130,000 teargas canisters over three weeks in June. In total, Turkey imported 628 tons of tear gas and pepper spray between 2000 and 2012, Turkish newspaper Sozcu reported, quoting Customs and Trade Minister Hayati Yazici. On July 16, 2013, the European Court of Human Rights ruled in the case of Abdullah Yaşa and Others v. Turkey that “improper firing of tear gas by Turkish police directly at protestors, injuring a 13 year old, had violated human rights,” and called for stronger safeguards to minimize the risk of death and injury resulting from its use.